This timeline identifies major women disability rights activists in the United States. Beginning with Elizabeth Packard's campaign for insane asylum inmate rights in 1869 and concluding with the recent women's Disability March on January 21, 2017, this timeline focuses on activism by women with disabilities for women with disabilities. a short introduction to the history of disability and disability activism in the U.S. Physical, intellectual, and emotional difference is a fact of life. Whether the product of genetics, as with muscular dystrophy or down syndrome; illnesses, like multiple sclerosis or polio; life experience, such as injury or abuse; or simply the process of aging, every person will or has encountered disability. For this reason, disability scholars often argue that we are all temporarily able-bodied (TABs) and that the disabled community is the largest and most diverse minority in the world. In many ways, the experience of disability is something that unites us. However, due to cultural fear and misunderstanding, disability has historically been used to divide, discriminate, and oppress. As disability historian Douglas C. Baynton notes in “Disability and the Justification of Inequality in American History,” “not only has it been considered justifiable to treat disabled people unequally, but the concept of disability has been used to justify discrimination against other groups by attributing disability to them.” Baynton goes on to describe how discrimination and prejudice against disability was employed in arguments for slavery, the suppression of women, and limits to immigration. In turn, abolitionists, suffragists, and proponents of immigration distance themselves from the concept of disability, often to the detriment of disabled individuals—Banyton notes that “rarely have oppressed groups denied that disability is an adequate justification for social and political inequality.” While historical discrimination against the disabled stretches back to the colonization of the North American continent there also exists a vibrant and inspiring history of disability advocacy and activism. The history of disability activism is the topic of this timeline and project; in particular, I look at women’s disability activists because women with disabilities are double subjugated due to their gender and ability making their lived experiences and their advocacy work more difficult to trace. Rejecting the notions that disabled individuals are less than, in need of cures and savior, and victims that should be pitied, the Women’s Disability Activism timeline focuses on women with disabilities engaging in self- and communal-activism. While there is a complicated history of the non-disabled advocating on behalf of or with disabled communities, since the Independent Living Movement of the 1970s, disability activism has been driven by disabled activists. The Women’s Disability Activism timeline seeks to expand our knowledge of women’s disability activism by looking at key figures, their arguments for disability and women’s rights, and the connections among activists. For more about my research methods, see the Inspiration section below. What can we learn from the Women’s Disability Activism timeline? 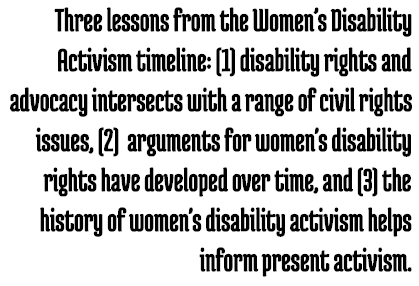 I hope that you can learn many things from the Women’s Disability Activism timeline, but three lessons stand out to me: (1) disability rights and advocacy intersects with a range of civil rights issues, (2) arguments for women’s disability rights have developed over time, and (3) the history of women’s disability activism helps inform present activism. Disability Rights Are Human Rights: The experience of disability cuts across all demographics from gender and race to socioeconomic status and religious affiliation. This means that disability activism intersects with many other civil rights issues. As you read through the individual entries, you’ll note that these activists broach the topics of married women’s legal rights, access to higher education, notions of motherhood, sexuality, and parenting; equal opportunity employment; the right to life; and political representation. That is, disability rights not only benefit people currently living with disabilities, but their fight for civil rights is integral to the fabric of humanity. While the Disability Rights Movement learned from the Civil Rights and Women’s Rights Movements, there is much that we can learn from disability activists. 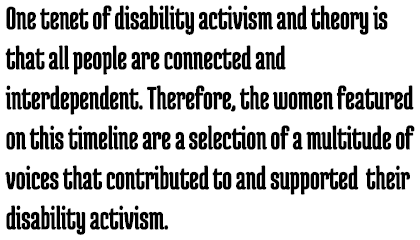 Patterns in Disability Activism: While the research presented here is far from comprehensive (see the following question for what and who is missing), this timeline indicates some patterns in disability activism broadly and for women in particular. I encourage you to draw your own conclusions and observations based on this research, but I tentatively identify three main waves of disability activism: single-issue disability activism (mid-1800s to mid-1900s), cross-disability activism based on accessibility (1960s-1980s), and critical, cultural disability activism (1990s-present). From the mid-1800s to mid-1900s, disability activism was single-issue, such as activism specifically for Deaf or blind communities. While activists during this period laid the groundwork for future activism, their concerns were often focused on single groups. Beginning in the 1960s and coalescing in the 1970s, the (cross-)Disability Rights Movement emphasized accessibility for a range of physical and intellectual disabilities. During this time, activists attempted to pass civil rights legislation based on the argument that disabled individuals can fully participate in society if given access. This era culminated in the Americans with Disabilities Act in 1990. Since the 1990s disability activism has shifted to focus on raising awareness of the cultural discrimination of visible and invisible impairments, broadly defined. This current wave of disability activism also critiques previous activism predicated on access, arguing that people with chronic illness or severe impairment do not benefit from physical access. Additionally, the Women’s Disability Activism timeline indicates some gaps in activism. For instance, prior to the mid-1800s the United States was pre-disability activism. During this time, conversations about disabled individuals focused on how best to confine and control them. During the 1940s and 1950s there was a lull in disability self-advocacy. While my research does not indicate the exact cause, I hypothesize that the polio epidemics during this time resulted in advocacy by caretakers and family members because the disease mostly affected children. Those who survived polio eventually began to advocate for themselves and participated in disability activism from the 1960s forward. Provides Context for Current Activism: In the current political climate, disability rights activists—like many other marginalized groups—are facing renewed discrimination and oppression. Since the 2016 election, disability rights groups, such as ADAPT, have been extremely instrumental in preserving the Affordable Care Act and preventing cuts to Medicaid and Social Security. Of course, these battles are far from over and will continue. While we must focus on the present and future rights of people with disabilities, looking to the past can help provide context for present activism. The women featured here are testaments to the power of the people to make social change. What and who is missing from this timeline? I made every effort to be as thorough as possible in finding women with disabilities who engaged in public, national grassroots and legislative political activism (see Inspiration for my research method). Still, many, many instances of women’s disability activism and advocacy as well as individuals are not represented on this timeline for a variety of reasons. For one thing, the scope of this timeline is activism by women with disabilities for women with disabilities. There are not specific entries for advocacy by temporarily able-bodied advocates or significant pieces of legislation or court cases. While non-disabled people have contributed to disability activism, I chose to focus on women with disabilities for reasons stated above. 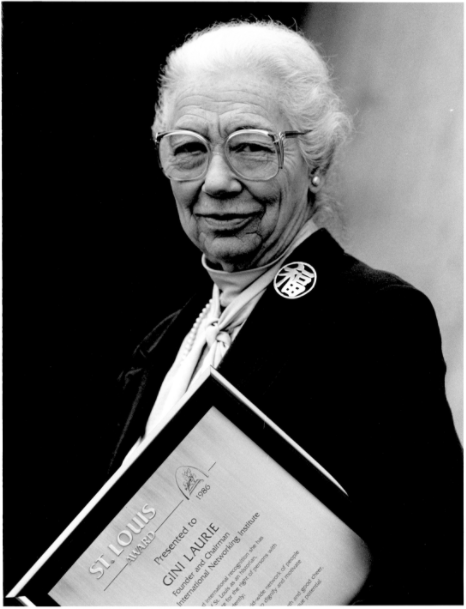 Therefore, you won’t see advocates such as Dorothea L. Dix, one of the first advocates for the disabled community beginning in 1843, and “the grandmother of the Independent Living Movement” Gini Laurie, who devoted her life to volunteering for polio survivors from 1958 until her death, despite their importance. While pieces of legislation and court cases are discussed in the context of disability activists, legislation is not the focus. For example, the Americans with Disabilities Act of 1990, a watershed piece of legislation that provided legal protection and accessibility for Americans with disabilities, is subsumed under timeline entries for Mary Lou Breslin and Patrisha Wright and critiques by Marta Russell. This emphasizes the people who fought for legislation, rather than the legislators. On the other hand, legislations restricting women’s bodies based on disability is not featured at all. The Buck v. Bell case of 1927, featuring three generations of Buck women, in which the Supreme Court permitted compulsory sterilization of people with intellectual disabilities has no place on this timeline. This was not an act of activism, but an act of injustice. While the above individuals and events are not within the scope of this timeline, there are countless women who should be included, but are not. As with any civil rights movement, a multitude of individuals contribute to social change. One tenet of disability activism and theory is that all people are connected and interdependent. Therefore, the women featured on this timeline are a selection of a multitude of voices that contributed to and supported their disability activism. For example, Kitty Cone’s entry on the timeline positions her as a leader of a group of 100 disabled individuals collectively participating in a sit-in. As noted above, this timeline also focuses on traditional and explicitly political forms of activism. Therefore, the traditions of women’s disability narratives (such as Mary L. Day, Lucy Grealy, and Sarah Manguso), actresses and performers with disabilities (such as Marlee Matlin, Linda Bove, and Gerri Jewel), among other non-activist public figures are not evident here. Additionally, one goal of this project was to provide primary documents from each woman featured on the timeline to capture their voices and trace common themes between their causes and types of arguments. Unfortunately, documentation is not always possible or preserved. That is, there are many other women’s voices who still remain uncovered. Finally, while the women featured here combat social oppression, violence, lack of access and education, and everything in between, they are often privileged in other ways. Many women featured here, particularly mid-1800s to mid-1900s, come from wealthy, white families who granted them some form of access and privilege. They used this access to advocate on behalf of the women who could not. And, while the Disability March (the most recent entry on this timeline), attempts a more inclusive and non-traditional form of activism, historically activism, such as protests, public speaking, and composing letters and legislation, emphasizes intellectual and, at least some, physical ability. A note on terminology: Terms for disability have shifted throughout U.S. history. As a catch-all term, I use “women with disabilities” to describe the women featured on this timeline because they all identify as “women,” but may use different terms for “disability.” When quoting from sources, I retain their terminology. For instance, “feebleminded,” “deaf and dumb,” and “deaf-mute” were frequently used in the 19th century, but are no longer considered appropriate. “Cripple” is a term that has shifted in usage. In the 1970s, the Disability Rights Movement rejected the term as derogatory. Since the 1990s, there has been an effort to reclaim the term. Some women on the timeline, particularly Cheryl Marie Wade, are part of this reclamation. a timeline of activism by and for women with disabilities in the U.S.
"Civilization is too far advanced not to acknowledge the justice of woman's cause. She herself is too strongly impelled by a noble hunger for something better than she has known, too highly inspired by the vista of the glorious future, not to rise with determination and might and move on till all barriers crumble and fall." The Introduction provides some information about the overall goal of this website and timeline; namely, to highlight key figures in the history of women’s disability activism, their arguments for disability and women’s rights, and theorize the connections among activists. However, I would like to take a moment to document some of the sources I used in the creation of this project and my personal and scholarly investment in women’s disability activism. 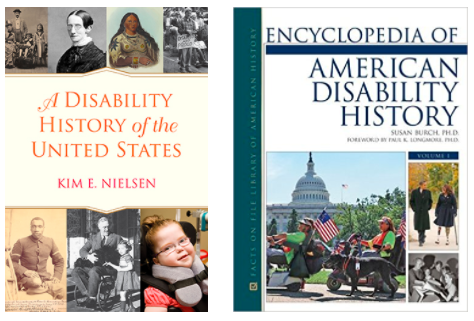 My primary sources for identifying women disability activists for this timeline were scholarly sources from disability historians: Kim E. Nielsen’s A Disability History of the United States and the Encyclopedia of American Disability History edited by Susan Burch. Nielsen’s book is one of the first to put the experiences and perspectives of people with disabilities at the center of American history. Her work provided me with a broad historical context of disability in the United States and some initial names of women activists. By reviewing all entries for women in the Encyclopedia of American Disability History, I found additional activists, using the definition of a woman with a disability who engaged in national, grassroots or legislative political activism for people with disabilities. After identifying individuals, I located significant primary documents and constructed the timeline entries based on Encyclopedia bios and my own interpretations of how primary documents fit in with the broader history of disability activism and women’s rights. You can view a complete works cited list, including primary documents, secondary research, and image attribution. This project is my most recent work in women’s disability activism, but my personal and scholarly interest has been developing for years. In 2012, my mother was diagnosed with Multiple Sclerosis, a chronic, degenerative illness that affects the central nervous system. MS manifests differently in each individual, but often effects physical and intellectual ability, is more prevalent in women, and is a largely invisible illness. My experiences with my mother’s life transition and our joint effort to apply for Social Security Disability Insurance highlighted the social and cultural stigma of chronic illness and prompted my choice to take a course in disability narratives during my first semester of graduate school at Texas Christian University. Since then, my interest in non-traditional women’s disability activism and self-advocacy has deepened and developed. The disastrous consequences of the 2016 election for women and people with disabilities has made this work ever more pressing. I began researching the national women’s disability activism movement when the Disability March took place in January of 2017. I hope to continue my work on women’s disability activism both within and beyond the academy. The Women’s Disability Activism timeline is one step toward that goal and, hopefully, not the last. As this section suggests, women disability activists have inspired me both personally and professionally. If you feel inspired by the women featured on this timeline and want to learn more about disability activism, I encourage you to Get Involved with one of the organizations below. 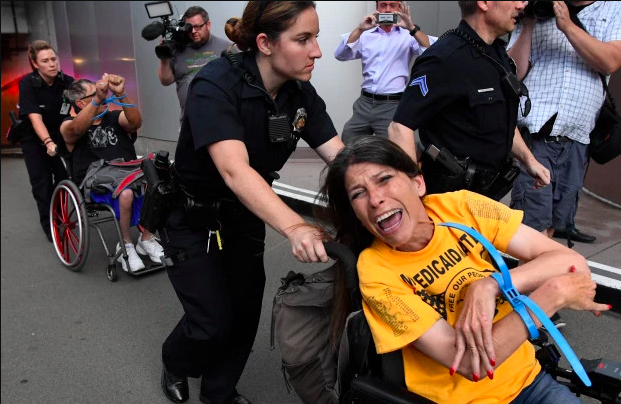 ADAPT describes itself as "a national grass-roots community that organizes disability rights activists to engage in nonviolent direct action, including civil disobedience, to assure the civil and human rights of people with disabilities to live in freedom." Recently, members of ADAPT have been instrumental in preserving Medicaid and the ACA. 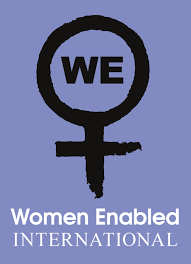 According to Women Enabled International (WEI), they work "at the intersection of women's rights and disability rights to advance the rights of women and girls with disabilities around the world." WEI is one of the few women-specific disability rights organizations active on a transnational level. The Disability Rights Education and Defense Fund (DREDF) was founded in 1979 by Mary Lou Breslin, Patrisha Wright, and others. DREDF 's mission is "to advance the civil and human rights of people with disabilities through legal advocacy, training, education, and public policy and legislative development." DREDF was instrumental in the passage and preservation of the Americans with Disabilities Act. "Americans seem to have lost sight of the fact that policies are social decisions and that these decisions can result in the de-valuation and even loss of human life. . . . Disability and disability policy—past, present and future—is a tool for all to rate our present socio/economic order." I must begin by thanking the women featured on this timeline for their courage. I am indebted to these women on a variety of counts. Not only would this work not be possible without them, but the disability rights that we have today would not be exist without their tireless and fearless work. You inspire me to continue your fight. I must also thank my mother, who both inspires and supports this work every single day. There are no words to express my gratitude and love. I would also like to thank my professors and fellow students at Texas Christian University, my graduate institution, who support this work. Prof. Alex Lemon, who first introduced me to disability studies and illness narratives effectively changing the course of my scholarship. Dr. Brad Lucas, who continues to provide guidance on my research on disability protest and activism. And, Dr. Charlotte Hogg, who provided the space to create this project. Additionally, thank you to Sara Kelm, Lexi Walston, and Ryan Wheeler for your perspectives and feedback on an earlier iteration of this project. Lastly, I would like to thank my father for imbuing me with an eye and enthusiasm for website design and for providing advice and the literal (server) space for this website.